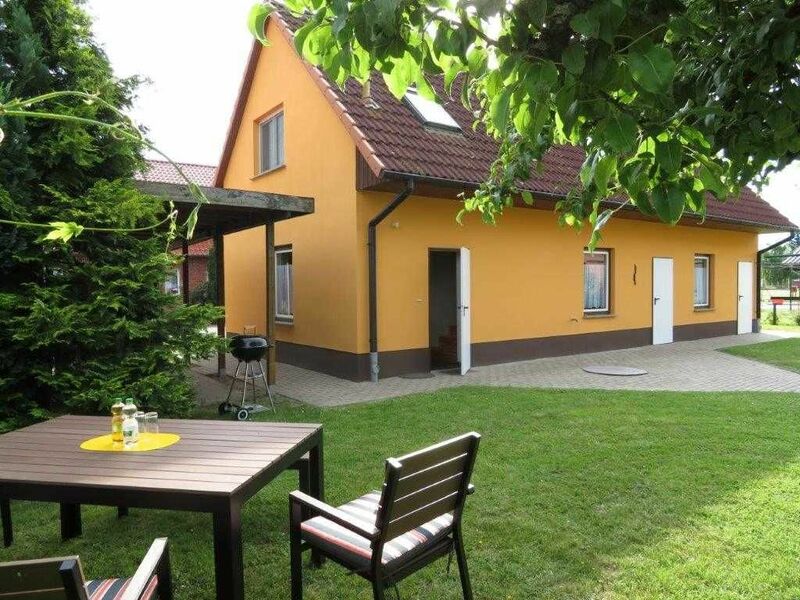 Non smoking cottage (50 sqm) in the attic of a separate building (EC garages) with space for 4 people and a toddler up to 3 years (cot and high chair included) a 1000 sq m site in the immediate vicinity of the Müritz (300 m). In the bedroom one has a double bed and a wardrobe, on request, in addition a cot. The second bedroom has two single beds (together) and a dresser. The bathroom has a shower and toilet. Kitchen: Crockery for 6 people, stove 4-fold, oven, refrigerator, microwave, coffee maker, kettle, toaster, hand mixer .... In the living room with dining area there is a large dining table for six people and a sofa. A large flat screen TV, radio and sound system provide entertainment Other: Wi-Fi (inclusive), various board games and books, brochures for the area, lockable shelter for bicycles, kayaks or canoes, a wagon, washing machine (coin operated 2 € / wash ) in separate arbor, parking. In the living room with dining area there is a large dining table for six people and a sofa. A large flat screen TV, radio and sound system provide entertainmentOther: Wi-Fi (inclusive), various board games and books, brochures for the environment, lockable shelter for bicycles, a carts, washing machine (coin machine 2 € / wash) in separate arbor, Parking spot. When booking a towel package this includes: 1 bath towel, 2 normal towels, 1 small towel. Die Ferienwohnung ist schön gelegen und bietet ausreichend Platz. Wir waren 2 Erwachsene, 3 Kinder im Alter zwischen 10 Monate und 11 Jahre und ein Hund. Es war alles sauber und gepflegt.